After releasing the popular HS-001 Middle Easterners kit in October 2012, MENG’s team has continued studying and developing 1:35 scale figures. 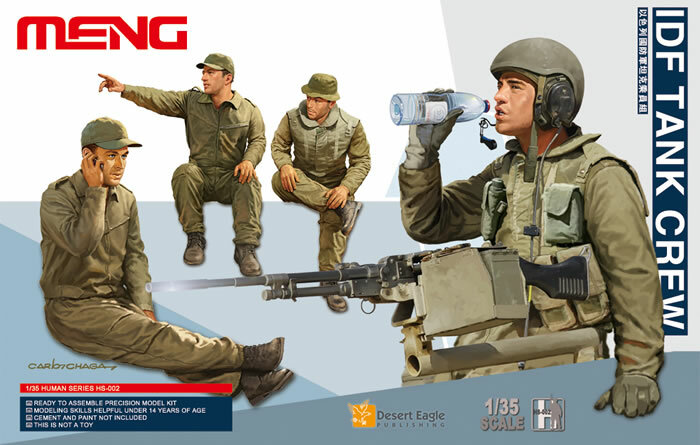 Now, we hereby announce our second figure kit in 1:35 scale, the HS-002 IDF Tank Crew. We have developed this kit with the help from our Israeli military advisor, Chinese sculptor and Brazilian illustrator. The 1:35 scale HS-002 IDF Tank Crew kit consists of 59 plastic parts on two sprues. Except the 8 drink bottles on one sprue, there are 51 parts on the other one for 4 figures of different gestures. These figures have rich facial expressions and they just look like real persons. It is worth mentioning that these figures’ clothes folds and details are represented in accordance with their own gestures. This kit is suitable for MENG TS-001 Israel Main Battle Tank Merkava Mk.3D Early, TS-005 Israel Main Battle Tank Merkava Mk.3 BAZ w/Nochri Dalet Mine Roller System and other IDF AFV models. During the development of HS-002 kit, we have studied a large number of photos and real items of IDF tank crews. Our designers have used sculpture softwares to simulate and modify various gestures, so as to ensure that these figures fit AFV models in a perfect way. In order to present better and sharper figure details, we have broken down the figures’ caps, helmet, heads, arms and legs. This HS-002 kit is a great addition to the IDF AFV models. We believe that you will like it."